- Renamed version Final to version 3.1, yay! - Removed Black Mage Focusing Gem from automatically being added to in the inventory and instead made it craftable. - Changed the functionality of the Black Mage Focusing Gem, it now acts as an override for any smithing perk requirements if you do not wish to meet them. It can be crafted with an empty common soul gem. 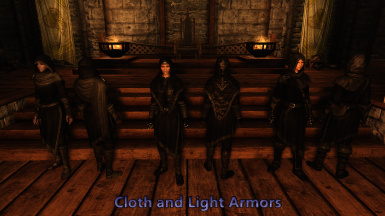 - Cloth versions of the armor are now available under the Misc section of the forge right away. - Light Armor versions now require either the Black Mage Focusing Gem or Steel Smithing/Advanced Armor Smithing/Glass Smithing to craft. - Heavy Armor versions now require either the Black Mage Focusing Gem or Orcish Smithing/Ebony Smithing to craft. - Light Armor Steel Plate and Ebony will now gain the Matching Set perk bonus. - Added a new Cloth Circlet with a special texture for the Archmage version. - Added new Cloth and Light College Robes and Boots, as well as a Hooded Scarf and Armwraps. - Implemented uncompressed textures into main file because compressed quality has been terrible for a while. Should have very little to no impact on performance. - Renamed things again due to me not liking the previous naming conventions done by past me. This is the last time...Probably. - Fixed some keywords in the .esp that incorrectly marked some light armor as heavy and some gloves as boots. 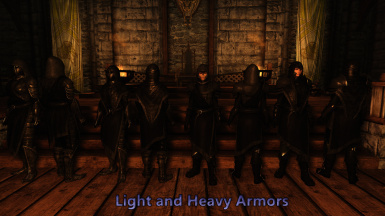 - New Light/Heavy Ebony - Black Archmage Armor. 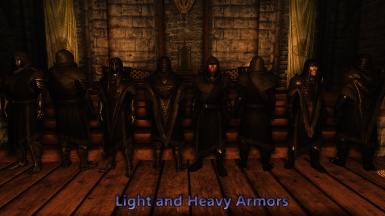 - New Light/Heavy Plate - Black Archmage Armor. 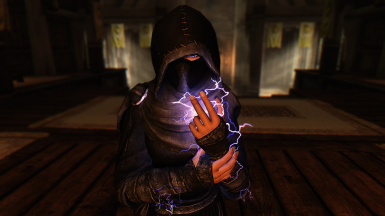 - Black Archmage Robes are now Cloth and Light. - Steel Plate Armor now has a Light version. - Crafting material requirement changes. - New chest added to the Archmage Quarters; requires Archmage Key to open and has pre-enchanted Black Archmage Chestpiece/Hoods. - Version of Light and Heavy Chestpiece/Hood that show up in the chest are based on the player's level. Cloth version will always be the same. - Upon installing or updating, the Black Mage Focusing Gem will automatically be added to your inventory. The Gem allows you to see Black Mage Armor crafting recipes in your blacksmithing window; remove the Gem and you will no longer see the recipes. 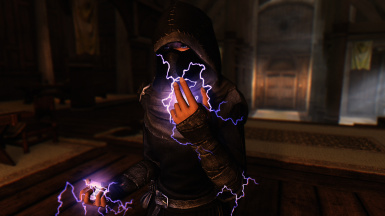 - Black Archmage Armor will become available for you to craft as soon as you've become the Archmage of Winterhold. 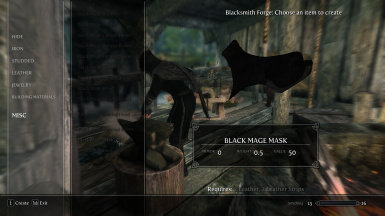 -Added new Light and Heavy Ebony Mage Armor sets under the Ebony section of blacksmithing, crafting materials for both sets are on par with the Daedric Set. 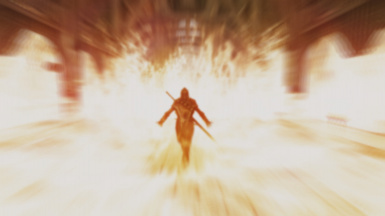 Statwise Heavy is on par with Daedric, Light with Dragonscale. 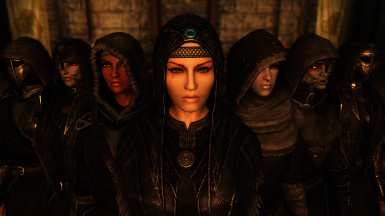 -Added new Cloth Black Archmage set, complete the Winterhold College questline and you will find pre-enchanted boots, hood, and robes in your quarters. Ability to craft unenchanted versions will also be unlocked upon becoming Archmage. -Removed blacksmithing perk requirements for crafting the sets. -Slight increase of crafting materials on Light/Heavy sets to compensate for no perk requirement. -Obtaining the Advanced Armor perk for Scaled Black Mage/Plated Black Mage sets or Ebony perk for Ebony Mage sets will still allow for bonus to upgrading. -New ground mesh for Scaled and Plated Black Mage Cuirasses. -Tweaked Plated Black Mage set textures, now with more shiny. -Fixed some issues with Hood/Mask normal textures. -Fixed issue with Hood where light reflection was slightly pink. -Tweaked other various textures ever so slightly. 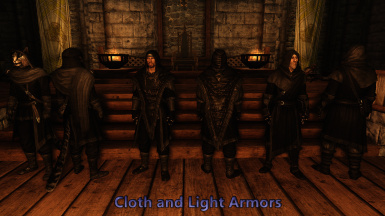 - Readded original hood meshes and textures in Cloth and Light Armor variations. - Slight tweaks to Heavy Armor values. - Slight tweaks to some textures. - Added a new mask. Can be worn with either hood variation, it has no armor rating but can be enchanted. - Light and Heavy armor values, crafting values, and tempering values all tweaked to be more in line with their positions in the Steel Section. - There are now 3 different versions of the Black Mage Armor; Cloth, Light, and Heavy. - New boots, gloves, and hoods for Cloth and Heavy. New gloves and hood for Light. - New robed breastplate for Light and Heavy. - Cloth now under the leather section of your blacksmithing window. - Light and Heavy are now Scaled and Plated; and require the Advanced Armor perk to craft and improve. - Added optional armorless version under the Misc section of your blacksmithing window. - Fixed bug caused by creation kit that made first person female models show the incorrect textures. College Set, Mantled Set, Archmage Set, 2 circlets, and the Black Mage Mask which can be worn with any of the hoods or helmets. Found under the Misc section at the forge. College Set, Mantled Set, Archmage Set, Steel Set, Steel Archmage Set, Ebony Set, and Ebony Archmage Set. Found under the Leather, Steel, and Ebony sections at the forge. Steel Set, Steel Archmage Set, Ebony Set, and Ebony Archmage Set. Found under the Steel and Ebony sections at the forge. Some sets will benefit from perks you have acquired such as Mage Armor, Matching Set, or Well Fitted. Cloth will be available for crafting right away, but in order to craft Light and Heavy versions you must either obtain the required smithing perks or craft a Black Mage Focusing Gem at the forge. 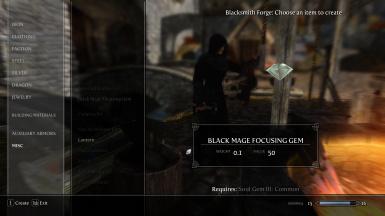 If you decide not to use the Focusing Gem, then you will be required to obtain Steel Smithing, Advanced Armor Smithing, and Glass Smithing for the Light Armors and Orcish Smithing and Ebony Smithing for the Heavy Armors. 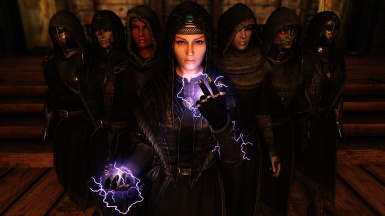 Black Archmage versions of the armor will become available for you to craft as soon as you've become the Archmage of Winterhold. 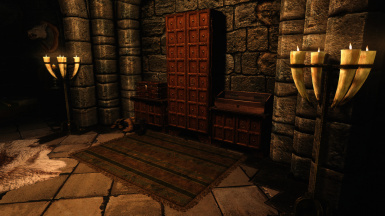 Pre-echanted versions of the Black Archmage Armor can be obtained from a locked chest in the Archmage's Quarters, the key required to open it is the same key given to you when you become Archmage. Use Mod Organizer, the Nexus Mod Manager, or extract the .7z file and place the Black Mage Armor.bsa and the Black Mage Armor.esp into your Skyrim\Data folder. Enable the Black Mage Armor.esp in the Skyrim Launcher under the Data Files section. You should overwrite all files when updating. Q1: Why does my beard clip through my mask? Q2: Can you add different colors? A2: Nope, Black Mage Armor will never have different colors. Q3: Can I just add the armor to my inventory? A3: To add any piece of armor to your inventory: open the console with ~, type Help "Black Mage" or Help "Black Archmage" to get the ItemID, type Player.AddItem ItemID 1 to add it. Any word can be added inside the quotation marks to refine your search and you can scroll through any results with Page Up/Page Down.